New age micro-pollutants, bisphenol-A (BPA) and triclosan (TCA), known for their carcinogenic effects in living organisms can effectively be removed from water using laccase from Trametes versicolor. Laccase was produced from T. versicolor JSRK13 in both submerged and solid-state fermentation (SmF and SSF) conditions. In SmF, T. versicolor JSRK13 gave the maximum production of laccase on the 10th day with an activity of 22 U mL− 1, whereas, in SSF 185 U g− 1 of the enzyme was produced on the 17th day. Maximum production of laccase was observed with Parthenium as substrate. Parthenium, with a particle size of 3–5 mm having 60% moisture was found to be a suitable substrate for laccase production and simultaneous transformation (LPST) of BPA in a synergistic manner. A one-step concentration using 85% ammonium sulphate followed by dialysis was sufficient to give 6.7-fold purification of laccase from the crude culture filtrate. Transformation of BPA was achieved in both SmF and SSF conditions along with the production of laccase, whereas TCA was degraded with free enzyme only. Above 90% of BPA (55–5 mg L− 1) was degraded using the LPST strategy with HBT acting as a mediator in the reaction. LPST strategy did not work for TCA as it completely inhibits the growth of T. versicolor JSRK13. TCA was degraded up to 75% (1.5–0.375 mg L− 1) by the free enzyme. Our study of simultaneous laccase production and transformation proved to be efficacious in case of BPA. The results indicate that industrial and sewage wastewater containing BPA can potentially be treated with T. versicolor JSRK13 laccase. The described strategy can further be used to develop a bioprocess which can work both on solid and liquid wastes containing BPA. The online version of this article ( https://doi.org/10.1007/s13205-019-1648-1) contains supplementary material, which is available to authorized users. 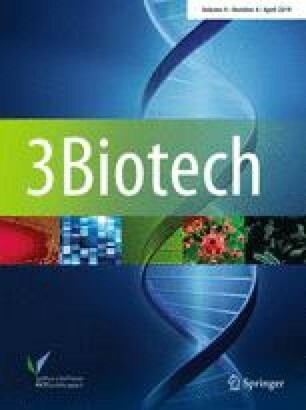 The author sincerely acknowledges the University Grants Commission, for sanctioning a Major Research Project on “Optimizing Production of Laccase Enzyme from Selected White-Rot Fungi and Developing a Process for the Degradation of Endocrine Disruptors”. [Grant no. 42-486/2013 (SR)].